A Little Latin, A Little History Book Review: Columbus' First Voyage Latin Selections from Peter Martyr's De Orbe Novo Constance Iacona and Edward George Bolchazy-Carducci Publishers Every junior Latinist knows that Gaul is divided in three parts. And every junior historian knows (we hope!) that "In 1492 / Columbus sailed the ocean blue." But there might be more to learn. In the typical Latin class, one learns the Latin of the Golden Age - Ovid, Vergil, Cicero... What isn't so widely realized is that at different times, the language of that age was taken up again by men of learning and sophistication (or at least those who wanted to appear as such). This means that from time you'll find a writer from another era whose prose won't be that different from Caesar's. One such man is Peter Martyr, who just happened to be hanging around the Spanish court when Columbus went on his first expeditions. Martyr wrote back home to former senior associates and the letters were such a hit that they were distributed all over. Were Martyr famous, it would be for the phrase "The New World." His "De Orbe Novo" is probably the first reference to the idea. But Martyr was not a starstruck fan of Columbus. He called 'em as he saw 'em, making for interesting reading as an intelligent observer gives one man's view of the living, breathing Cristopher Columbus, both from personal observation and based on chats with the Columbus' crew and numerous others. In Columbus' First Voyage, the authors take a handful of excerpts from Martyr's writing, put in extensive glosses to help the beginning student along and include copious notes on what others were writing, as well as what the historical literature has turned up. What results is not quite a Latin primer and not quite histori(ographi)cal scholarship, but a mix of the two that should remind high school and college students - and other readers of Latin - that they have special tools for approaching and understanding the past that others might lack and that are worth developing. Columbus' First Voyage is not a comprehensive look at Martyr, Columbus or the implications of the discovery of "A New World." But it is an excellent starting point for those seeking an often overlooked perspective about the explorer - that of the people of his own time. In Columbus' First Voyage, less advanced students have a relatively authentic bit of prose to work through with interesting subject matter. But more than that, general readers with some Latin have a nicely assembled source book dealing with a historical matter often debated in 20th/21st century terms but rarely considered from the vantage point of those who lived through the period. The nice folks at Bolchazy-Carducci Publishers have sent me two more Latin books for review. 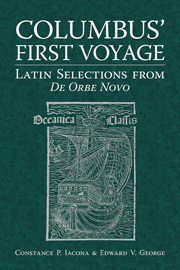 The one I’m reviewing here got me really excited: Columbus’ First Voyage: Latin Selections from Peter Martyr’s De Orbe Novo by Constance Iacona and Edward George Peter Martyr was a contemporary of Christopher Columbus. He was educated in Rome as a geographer, and then went to Spain to act as a diplomat. When he left Italy he promised his patron that he would report frequently. He certainly kept his word. For ten years he wrote about the conquest of the Americas - in fact he’s credited with having coined the phrase “The New World”. Martyr personally interviewed Columbus on his return, plus many of his shipmates. As more and more happened across the sea, Martyr’s reports were the primary source of the news outside of Spain. Anyway, this book is a collection of five passages from Martyr’s De Orbe Novo, plus supplementary materials to both aid, and interest the Latin scholar. I really like the concept behind this book. It is hard for us to think about now, but until about 300 years ago all European scholarly writing was in Latin. Every educated person could read it in addition to their native tongue. Most current Latin courses focus on Classical authors, but there is a lot of really fascinating material in Latin for students to read. I think it’s great that Latin educators today are finding good ways to keep Latin study fun. For each of the five passages there are: * the Latin text * a brief English summary * detailed analysis of the passages * vocabulary and notes * an illustration There are also lots of other bits such as a chart comparing Latin, Spanish, and modern English forms of the names of the major players in the text: Christophorus Colo-nus, Cristóbal Cólon, Christopher Columbus. There are also timelines, maps, auxiliary sentences from De Orbe Novo, and a full vocabulary list at the end. I had a good time going through this book and I hope that more works like this are produced. My only complaint, and it’s my usual one, is that the book is too short. Of course, I also think that the extended 11 hour DVD version of The Lord of the Rings is too short. I have just received a copy of _Columbus's First Voyage: Latin Selections from Peter Martyr's De Orbe Novo_ by Constance Iacona and Ed George. I really didn't think I was going to have time to look at this slim but delightful little volume this afternoon, but I got sucked in. The preface describes how Peter Martyr had actually interviewed Columbus and his crew, which sounded almost too modern. Of course, there are other historical sources from the period which differ in some regard from what he has written, but the authors of this text give several suggestions for the reasons this is the case. I was just about to save this text for later when my beloved methods prof, the late Gareth Morgan, was mentioned in regard to the use of Auxiliary Sentences. I admit that I didn't know about his auxiliary sentences, but this strategy does not surprise me in the least. That is, in the back of the book there are sets of Auxiliary Sentences for each section that you can read in order to understand the grammar in the actual section. I was intrigued so I turned straight away to these sentences. After reading through the dozen sentences which increased in length or complexity, I was able to read the first section of the narrative with no problem. (Keep in mind that after teaching just level one Latin for several years, you do admittedly get a little rusty with more complex sentences.) I immediately jumped to the second section, pausing long enough to work through the auxiliary sentences first, which are truly valuable. Now, perhaps I'm just ignorant of my early American history, but there was something fascinating to me (who knows why) to learn that the Santa Maria was a cargo vessel while the other two were caravels (?) or light merchant ships. I didn't realize Columbus and company had discovered what is now Cuba and Haiti/Dominican Republic first. I'm eager to read more, but really need to grade papers. There are some other features about this book which I like a lot. First, MACRONS! If I'm going to take the time to work on my own reading skills, I want to learn new words the RIGHT WAY--in context and with the right pronunciation. I can't do this if the words don't have macrons because then I'm forever debating in my head how the word must sound unless I stop to look it up, and then it becomes tedious work, quickly tossed aside. Hidden vowel quantities aren't marked (rex really should be rEx), but otherwise I'm thrilled to see the macrons. I want to be able to *hear* what I'm reading and without a native speaker around, I'm all I've got. Next, there are wonderful, wonderful woodcuts throughout. I love this kind of stuff, but then I'm a sucker for old books. Timelines are also included, as well as facing vocabulary and notes, a glossary at the back, maps, plus background material. My only disappointments in the book are 1) it's too short! There are only 5 passages/sections and after two I'm hooked for more, and 2) I fear that it may be a little more than most people would want to spend on a 40 page text at $17--oh, but wait! The website (www.bolchazy.com) says it has been discounted to $12.75. However, I can tell more time went into book preparation on this volume than in previous volumes I've seen of other authors--that is, taking the time to typeset and double check macrons is no easy task and probably something that editors are often eager to avoid. I applaud the editors of this volume, LeaAnn Osburn and Vicki Wine, for sticking to their guns and taking the time to produce a QUALITY reader for those of us who want to continue with building their reading skills. (I confess I have put down books that I would otherwise have eagerly continued to read because I really wanted to *hear* what I was reading and became too frustrated with the lack of macrons.) I know that I'm probably on my own with my obsession for macrons so that I can pronounce new words in context and learn them in that fashion, but having them means I really will finish reading this book, as opposed to other fairly recent texts that lacked them and are now gathering dust. I personally think this Columbus text would be great to have as a class set to use for when the AP Exams are over, or for a break at Thanksgiving. It's a small tidbit, but just the right size for sticking into your curriculum once your students have met subjunctives. Earmark your fundraising money for a set of these. If nothing else, it lets students see a true international language at work.